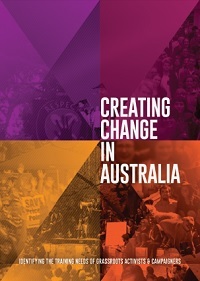 The Creating Change in Australia report provides new clarity for the training needs of grassroots activists and campaigners working on the frontlines. This short summary report provides an overview of the key findings and recommendations extracted from the full report (web resolution or link for high resolution download). The training needs for grassroots activists in Australia are growing rapidly. This is due to increasing encroachment upon communities by corporate interests, a host of pressing environmental challenges that need to be addressed, and the election of a conservative federal government intent on dismantling even rudimentary social and ecological justice achievements and safeguards. The next decades will require better resourced, more strategic, and more effective campaigning and movement building to achieve the ecological and social aims that Australian communities are wanting. The report was informed by extensive research into the training needs of grassroots activists and campaigners in Australia. The research involved more than 15 interviews with a range of campaigners across various sectors, an online survey that engaged 106 practicing activists, and 3 short case studies (Occupy Melbourne, Kimberley gas hub & Lock the gate) informed by more than a decade of campaign activism experience by the lead author. The research makes a strong case for the need to provide more extensive support and resources for activist training in Australia in the coming years. Capacity building, community organising, volunteer retention, functional group dynamics and effective facilitation. Engaging the broader community to grow campaigns beyond the population of people already knowledgeable, concerned or active on the issue. Developing cohesive narratives and telling our stories effectively. Practical skills for communication: social media, graphic design, video. Building skills to counter public relations campaigns or spin directed against a campaign. A major need was practical direct action planning – the mechanics of organising and successfully capitalising on safe and effective civil disobedience actions that provide leverage for change. Practical support for actions and increased understanding of the legal system, both in relation to rights during civil disobedience actions but also broader legal strategies for intervening in projects. The report found that a large percentage of dedicated campaign activists are either unpaid or underpaid, leading to under resourced campaigns. New approaches to resourcing and further training need to be developed to support critical environmental and social justice campaigns across Australia. The report also highlights the need to combine older forms of campaign activism that have proven effective with newer network centric approaches that use social media and collaborative strategies and where appropriate expand to include tactics outside the political sphere, such as corporate divestment and challenging companies social license to operate. Review existing training resources to identify opportunities for reuse and customisation to meet the identified training needs as prioritised by campaigners in Australia. Identify gaps in existing training resources, and develop or adapt written resources to fill these gaps. Make training resources available online to support the extended reach of the training program and materials. Further develop ‘rapid response’ practical training programs that support community building and direct action training for emerging areas of high need. Additional funding should be sought to support the above recommended resource development and pilot training delivery.